To haul these saw logs in the snow. They all thought we were the Prince of Wales. Lotsa bread and a big cuppa tay. The pick of the town there is no doubt. We all joined up in a sing song. And started home with the same old crew. We think of the time that we had on the way. “What a Time on the Way” was one of only two songs Gordon recorded from Israel Lawrence Phillips (1883-1967) who lived near Akeley, Minnesota. Israel was the son of Reuben Phillips who was also recorded by Gordon. Like most songs in the collection, Gordon only recorded two verses of Phillips’ version. Unlike most other songs Gordon collected, he unfortunately did not obtain a manuscript version to flesh out the full text. 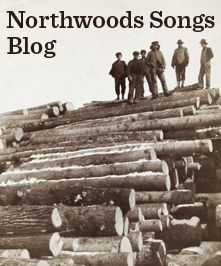 I featured Gordon’s two verse fragment (verses one and three above) in the October 2013 Northwoods Songs. To create the longer version above, I adapted some verses from similar songs collected in Ontario by Edith Fowke. Special thanks to everyone that has supported The Lost Forty Project this year! Please consider taking the Minnesota Folksong Challenge and learning a song yourself! Saying stand and deliver boys for all I wants your money. And all that we have in our box is our bedin and our clothing. Saying stand and deliver boys for I’me a money taker. Ide have fought like a hero although Ime but a woman. You discharged my pistols and loded them with water. I think it hard that I must die just for grabing money. From 1923 through 1927, folklorist and song collector Robert Winslow Gordon edited a column in the pulp magazine Adventure called “Old Songs That Men Have Sung.” Each column included folksong texts sent in by readers from their own memories, personal song notebooks and singing friends and family members. Gordon received over 3000 letters from readers, many in search of words to half-remembered songs and many contributing songs themselves. During my trip to the American Folklife Center this past June I was able to sift through these letters and Gordon’s typed responses to them – all of which are in the AFC’s amazing archive. Going through the letters (the AFC staff allowed me to work with the brittle originals!) gave me insight into the lives and motivations of singers from that era. Many writers lamented the changing times and the loss of the traditional singing cultures they grew up with. I am an old man and my hand shakes so that I am compeled to use a pencil insted of pen and ink but I am going to send you a few old songs that men have sung if you can use them well and good if not why just a little time spent. A MOST valuable contribution arrived last week from Mr. R. W. Phillips of Akeley, Minnesota—a forty-six-page manuscript of twenty-two songs, every one of them worth while! I have sent Mr.Phillips, in your name and mine, our heartiest thanks. May his voice be heard often! Above, I have given the text as Phillips supplied it, complete with unconventional spellings. The transcription is my own based on a wax cylinder recording made by Gordon of Phillips during a visit to Akeley (from what I can tell in researching the family, the Phillipses lived south of Akeley near Chamberlain, MN) the same year he received the letter. The song is a distant variant of “Whiskey in the Jar.” Similar versions were collected in Vermont and Maine but Phillips’ melody is quite unique… and fun to sing! More on this song and its more well-known variant “Whiskey in the Jar” here.